Choosing the best running shoes for men can be considered such an arduous process for some, as well as one of the most subjective and personal purchases one will make in their lifetime. An incorrect shoe selection may bring on consequences like a loss of time and money caused by running around town haggling for a refund on a shoe that gives you enough blisters to completely drain your quality of life. So, What Are The 3 Best Running Shoes For Men? How Do I Choose The Best Running Shoes For Men? To ensure that this experience doesn’t happen to you, it is imperative that you ask yourself 3 basic questions: How often do I walk? Will I want to play the sport in the near future, and if so, which one, and finally, do I have any special foot conditions? I.e. do I blister easily? If you managed to answer all those, you’re now a few steps closer to finding the perfect shoe. In this fast paced world, people spend a great deal of time on their feet. We commute from home to work, from work to the gym, to grab some shopping after our workouts before finally heading back home to rest the very feet we have been putting weight on and stressing all day while we go about our lives. The point is, with great attention paid to maintain an adequate comfort level of your feet through purchasing the best running shoes for men out there, you are highly likely to have an easier time in this life which will ultimately lead to you becoming a more warm and positive individual to others and most importantly yourself. Since 1949, ASICS shoes have been renowned for offering athletes and fitness fanatics around the world benefits such as comfort, utility, and durability. The brand has additionally manufactured shoes which incorporate technologies that pertain to the prevention of injury, displayed by their rugby and football selections. When it comes to running, however, the following shoes have been determined by experts to be the best running shoes for men. The GT-2000 shoe is arguably one of the best running shoes for men, as it offers the wearer improved midsole support due to the design of a new shank to lessen the load on the calves and feet. The arch is reinforced with the overall design curving further up into the shoe’s arch and the inclusion of the new Dynamic Duomax medial post to assist in the reduction of the foot’s inward roll maintains a smoother ride for the wearer. The Dynamic Duomax foam is coated with a uniform pattern which matches the midsole to make for a more ‘fluid’ look to the overall design. The heel serves as the home for the GEL cushioning system that is made from Asics SoLyte foam to additionally make up the 10mm remaining midsole drop. The GT-2000 implements Asics High Abrasion Resistant (AHAR) carbon rubber at the heel to allow for increased durability while also providing soft blown rubber to absorb impact to the wearer when traveling on bitumen. What else makes this one of the best running shoes for men? The patterns on the GT-2000 are identical and overlayed in the hopes of allowing for a secure heel and mid-foot fit with most of the overlays sewn apart from the toe box which is a split overlay joined onto the GT-2000’s lateral and medial parts. The shoe’s mesh has been reported to be breathable and the inner linings are comprised of a ribbed material and Personal Heel Fit (PHF) memory foam. The GT-2000’s upper section is rounded out by a thick sock liner made from OrthoLite foam. Overall, the reasons for this shoe being dubbed one of the best running shoes for men stems from the fact it provides added stability that is complemented with an excellent cushioning design useful for running on hard surfaces such as paved roads. Torsion directed at the shoe’s arch is raised thanks to the GT-2000’s midfoot shank and the forefoot has been designed to provide optimal flexibility. This is also classed as one of the best running shoes for men as its outsole generally displays very vague signs of wear when used on asphalt surfaces. Testers have confirmed the design allows for the accommodation of several different foot shapes while also offering superior aesthetics coupled with optimal support for the midfoot and a comfortable feel on the forefoot. The Kayano 20 is another suitable choice as one of the best running shoes for men. People known to experience irritations brought on by over-pronation are recommended to purchase this shoe because with the introduction of new footwear technologies such as Fluid Fit and Fluid Ride, pronation issues will likely cease to exist whilst wearing a pair of Kayanos. Fluid Fit is a multi-directional stretch fabric used to optimize the fit of the wearer’s foot in the upper part of the shoe, overall achieving increased comfort. Fluid Ride can be described as a midsole comprised of two layers of the platform with the combination of cushioning materials such as SpEVA used for the top layer and SoLtye on the bottom. Putting it simply, Fluid Fit is a mesh which aims to create a ‘glove-like’ fit for the wearer while Fluid Ride is a lightweight material ideal to be harnessed by athletes performing sprints or cross-country training. The goals incorporated into the design of the Kayano 20 to make it one of the best running shoes for men are reducing the overall weight as well as creating an improvement in shock attenuation while additionally providing a better bounce back feeling the from result of the Fluid Ride. Like the GT-2000, the Kayano 20 also possesses the Dynamic Duomax System working again by creating an appropriately proportioned distribution of pressure with the intent of maximizing stability as well as maintaining overall comfort. Cushioning is supplied both in the rear and forefoot via the GEL system that works to attenuate all shock on impacts and toe-off phases. This system additionally allows for added movement while the wearer’s foot travels through its gait cycle (the repetitive pattern comprising of steps and strides). The combination of these features makes the Kayano 20 one of the best running shoes for men with low to average arches by keeping the wearer’s foot in alignment and providing the required amount of shock absorption and cushioning. The Kayano 20s weigh in at around 11.3oz and have a heel-to-toe drop of 10mm. Again, like the GT-2000, Kayano 20s use the AHAR rubber on its outsole. Men’s colors for the Kayano 20 range from lightning silver royal to pine lightning white followed by white galaxy midnight to black onyx and black white gold finishes. The shoe as a whole has been billed as one of the lightest versions of the Kayano series ever produced after 20 years, deemed suitable primarily for road travel and heavy runners. Described to offer a smooth ride while providing an excellent fit, Cumulus 15s offer the wearer both fore and rear foot GEL support while you run on hard surfaces, making it another one of the best running shoes for men. Another shoe with a dual-layered midsole, the Cumulus 15 utilizes an upper area constructed with adequate mesh to provide its wearers with a longer lasting comfort. The Cumulus 15 weighs in at 11.4oz for a size 9 and holds a forefoot measurement of around 20mm. Classed as a neutral shoe for use in daily training, Cumulus 15s imply a silicone-based gel cushioning system to assist with shock absorption in both the rear and forefoot. The SoLyte midsole is incorporated into this shoe for appropriate cushioning. Gait efficiency is again accounted for by a full-length guidance line running from the heel to the forefoot and a Space Trusstic System is in place to improve torsional rigidity through a thermal plastic midfoot unit. More qualities that make this shoe one of the best running shoes for men is the inclusion of an Impact Guidance System which specializes in optimizing heel-to-toe transitioning for wearers. Addressing the upper part of the shoe, breathability is achieved through the provision of excellent mesh covering and the utilization of a PHF system. Anti-bacterial materials were used to construct a ComforDry Sockliner to help lower the presence of odors while simultaneously providing further cushioning. Even more cushioning is offered from SoLyte 45 foam, further solidifying the Columbus 15’s position as one of the best running shoes for men. Regarding the shoe’s outsole, AHAR is included in the heel to allow for maximum durability and an AHAR compound is used to make a DuraSponge Outsole towards the forefoot. People should strictly be encouraged to not confuse running shoes with those worn by professional athletes and sports enthusiasts, for it is like comparing apples and oranges. Most people find it easier to walk in a pair of running shoes as opposed to running in running shoes, which is why it is common to see people wearing cross trainers to fill the role of a casual shoe; however, these the style shoes are ideally designed for athletics. ​Trail runners are a shoe designed for those that favor the idea of going bushwalking, for, as the name states, they are shoes designed with a sole capable of withstanding continuous running on dirt surfaces. This type of shoe is a preferred choice for mountain climbers and those passionate about hiking. Finally, there are road runners, designed with the purpose of withstanding constant contact with asphalt and bitumen surfaces. Marathon runners are commonly sighted sporting a pair these shoes. ​Making the optimal purchase choice of footwear comes down to being informed about all the relevant criteria required in a good running shoe. These shoes are made up of so many parts that a lack of understanding in any of them will likely result in the purchase of a pair likely to leave you dissatisfied and miserable with blisters in a month’s time; therefore, it is ideal to have a basic knowledge of all a shoe’s parts and what they do. ​Firstly, the ‘upper’ refers to all the materials used in the design which exists at the top of the foot. Overlays are one of these materials that are synthetic in nature and primarily serve to supply reinforcement and support. The ‘last’ is the material used to keep the upper attached to the shoe’s midsole; the part of the shoe comprised of mainly plastic matter, which if assembled correctly will dictate the shoe’s overall longevity or durability. ​Finally, there is the outsole which is commonly made up of rubber and located on the shoe’s bottom. The main function of the outsole is to allow for traction which additionally determines the softness of the shoe as the wearer moves around in it. When picking out the best running shoes for men, you want to look for an outsole made up of carbon rubber to allow for maximum durability and or blown rubber that acts as a lighter material commonly air-injected, providing increased overall flexibility. 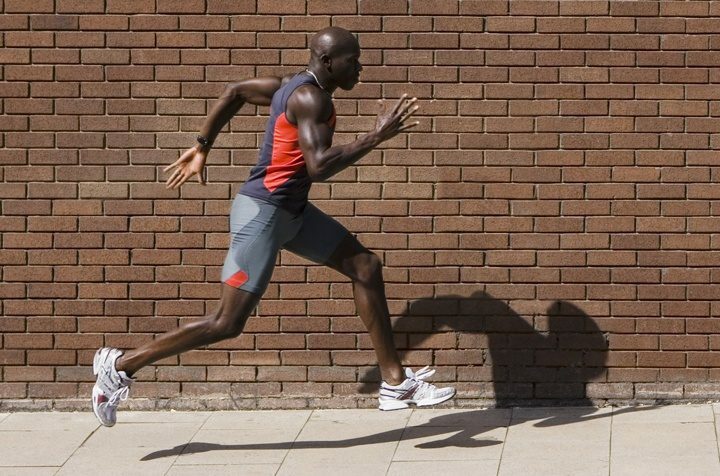 ​Selecting the best running shoe for men is no easy task. There are so many variables to consider in the process; from comfort, affordability, durability, and utility. All are crucial areas which demand attention before a decision to buy is made. ​People’s feet are so uniquely distinct that a sole thickness of 1mm could mean the difference between stability and injury to some individuals while some shoe enthusiasts will experience a significant difference from a pair containing a heightened arch to one without. ​You need to find the right balance of all these criteria that best fits your needs, as the key to everything in life is moderation and how well we maintain the balance determines our overall experience. Check Price and See Catalog Best Sellers on Amazon Now!